A research paper entitled "Some exact solutions for debris and avalanche flows" by Dr. Shiva P. Pudasaini, visiting faculty at Departmet of Natural Sciences, School of Science, Kathmandu University has been recently published in Physics of Fuild: 23,043301(2011). Kathmandu University has established Japan-Desk at its central library in Dhulikhel. The desk will provide information on recent natural disaster and its aftermath scenario in Japan. The desk will also provide information on study in Japan, scholarship scheme and faculty exchange opportunities for faculty/staff and students of Kathmandu University. Japanese Embassy in Kathmandu has provided relevant materials for display and distribution in the desk. The center is inagurated by Prof. Dr. Bhadraman Tuladhar. Ms. Natsuko Hashimoto, cultural secretary of Japanese Embassy also attended the program. Japanese Ambassador to Nepal, H.E. Mr. Tatsuo Mizuno has hosted special dinner program at his official residence in Tahachal in the honor of Kathmandu University officials on March 17th 2011 evening. During the program, Ambassador Mr. Mizuno briefed about recent earthquake and tsunami in Japan. 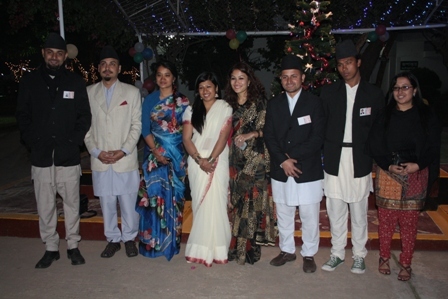 The dinner was attended by Prof. Dr. Suresh Raj Sharma, VC of KU, Prof. Dr. Bhadra Man Tuladhar, Registrar KU, Prof. Dr. Ramkatha Makaju, Director of Dhulikhel hospital and Mrs. Andrea Makaju, Dr. Bim Prasad Shrestha from School of Engineering and Dr. Sagar Raj Sharma from School of Arts at Kathamandu University. The program was also attended by Japanese Embassy officials looking after Japanese governmental overseas developmental assistance program in Nepal. Dr. Suresh Raj Sharma has expressed deep condolence for the bereaved family of Japan worst hit by recent earth quake and tsunami and handed over the letter expressing solidarity with people of Japan to over come casualty caused by recent natural disaster. Dr. Bhadraman Tuladhar has also expressed similar concern. Dr. Ramkantha Makaju appreciated Japanese governmental support extended to Dhulikhel Hospital and assured the Japanese ambassador to let him know how Kathmandu University family can help the people of Japan at this time. It was agreed to establish Japan Desk at central library of Kathmandu University at Dhulikhel to disseminate accurate information of recent disaster and ongoing rescue activities in Japan. The ambassador of Japan has assured to provide information materials from the Embassy of Japan to Kathmandu University to be kept in Japan Desk. 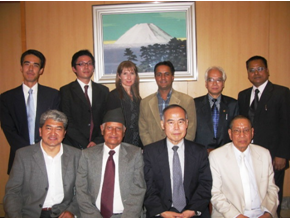 During the meeting several areas of cooperation between Japan and Kathmandu University and Dhulikhel hospital were discussed. Rt. 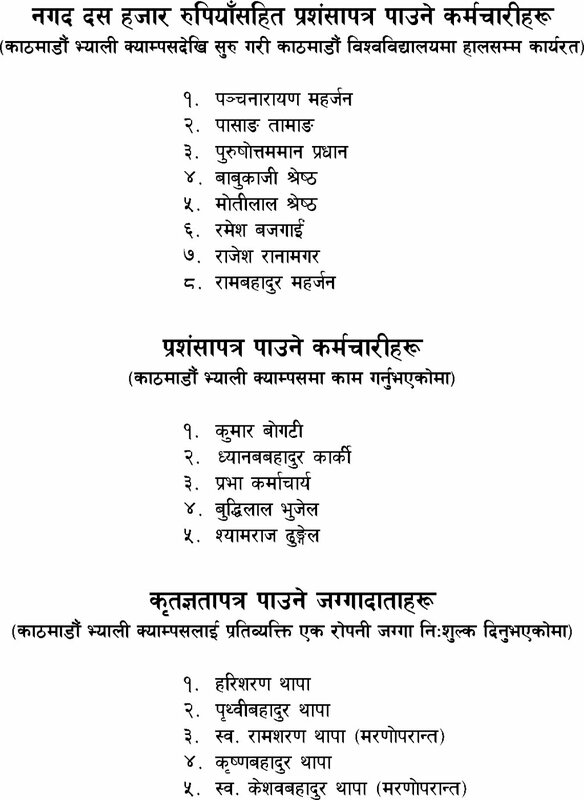 Hon'ble Prime Minister and Chancellor of Kathmandu University Mr. Jhala Nath Khanal has reappointed Prof. Dr. Bhadra Man Tuladhar as the Registrar of Kathmandu University as per the Kathmandu University Act 2048. The appointment is effective from March 16, 2011 for four years. Dr. Tuladhar is a Professor of Mathematics. He is also one of the founders of Kathmandu University, and a Life Member in its Board of Trustees. Dr. Kanhaiya Jha, an associate professor of mathematics in School of Science, presented his research paper as an invited speaker entitled “Generalized common fixed point theorem in metric space by altering distances between points” in the Fifth World Conference on 21st Century Mathematics (WC) 2011 organized by Abdus Salam School of Mathematical Sciences (ASSMS), GC University, Lahore, Pakistan from February 9-13, 2011. The ASSMS that was established in 2003 by the name of Prof. Dr. Abdus Salam (1924 – 1997), the Nobel Laureate of Theoretical Physics in 1979, has become a unique and leading research center of mathematics in Pakistan as well as in SAARC region. Dr. Jha also got an opportunity to work with Prof. Dr. Josip Pecaric from University of Zagreb, Croatia and his research students at ASSMS. Prof. Pecaric is renowned leading mathematician of Convex Analysis having more than 800 research papers and equivalent citations in American Mathematical Society (AMS) Mathematical Review Numbers. During his visit, Dr. Jha communicated TWO research papers in the peer reviewed mathematical journals. Moreover, Dr. Jha interacted with other professors from different universities about future mathematical events and possible collaborative research activities in Nepal. Prof. Dr. Bhadraman Tuladhar, Registrar of Kathmandu University has inaugurated the demonstration lighting of street lamps by switching on the generator on the eve of MAHASHIVRATRI ( March 2nd 1011 ) at Tankeswar Mahadev tempble of Kalimati area at Kathmandu Metropolitan City. Everyday, tones of organic waste are produced from Kalimati market, that can be used to produce biogas by anaerobic digestion process. The produced biogas can be used to generate electricity. Department of Mechanical Engineering at Kathmandu University has collaborated with Tankeswor Mahadev Preservation Society to launch project on installation of biogas plant for generation of electricity for street lighting at Tankeswor Mahadev area situated at the bank of Bishnumati River using vegetable waste of Kalimati Vegetable and Fruit Market. The program is being supported by Canadian Cooperation Organization. In this project, the students have installed 10 m3 biogas plant as per guideline set by BSP Nepal with slight modification in the feeding section consisting of a chopping mechanism for vegetable waste. The produced biogas can run gas-engine to generate electricity for about 5 hours per day. This electricity can be used for street lighting at Tankeswor area, Mahadev temple, dead body burning areas (Masan ghat ), ritual house (kiriya ghar), and bhajan ghar using CFL bulbs. Dr Rajendra Gyawali delivered an invited lecture on “Pharmacognostical research, development and opportunities in Nepalese Himalayan Plants” in first international conference of society of Pharmacognosy, held in Belgaum India, 18-20 Feb, 2011. Prof. Dr. Badoux, the former President of Swiss Federal Institute of Technology Lausanne (EPFL) and the Chief Guest of 12th KU-Convocation 2006, made a visit to Kathmandu University from 17th to 21st February 2011. He is a member of the Board of Directors of Happy House Foundation (HHF), which is a Non-Government Organization founded by Mr. and Mrs. Ullens in Switzerland. Centre for Excellence in Production and Transportation of Electrical Energy (CEPTE) is coordinating the research activities at School of Engineering supported by HHF. During his stay, he discussed with the Vice Chancellor, Registrar, Deans of School of Engineering and School of Science, Professors and Heads from different departments, Faculties and Research Fellows of HHF regarding effectiveness of Research and Development activities supported by HHF of Kathmandu University since 2004. He also had meetings with ex-HHF fellows and recruited new researchers to carry on the work being done in CEPTE. Group discussion regarding the future of Civil Engineering Department of KU was conducted. Splitting the department into different specialization groups like Hydropower, Geotechnical and Environmental Engineering courses were discussed. He also delivered a speech in the Kathmandu University Lecture Series (KULS-XXI) and interacted with many students and faculties of the University. The topic of his speech was “International Engineering Consulting and Construction Practices: Foundation for infrastructure development”. With quotes like- “The biggest risk is to take no risk” and “Innovation gets us to the top, Excellence keeps us there” he surely influenced the students and faculties to work towards their goal and act responsibly. “Don’t mind having dirty hands” is what he always said, encouraging students to work hard and be sincere and honest. His support and belief in Kathmandu University will always be acknowledged. On behalf of School of Engineering, CEPTE extends its gratitude to Prof. Badoux for his continued support in recruiting research fellows and his vision to establish this institution. 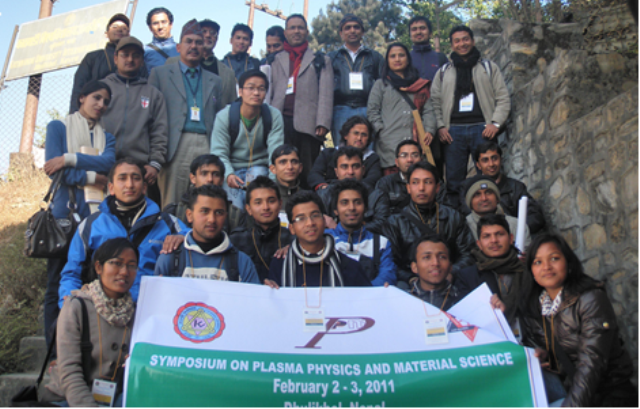 Two-day Symposium on Plasma Physics and Material Science was jointly organized by the Department of Natural Sciences (Physics), Kathmandu University and Central Department of Physics, Tribhuvan University, Nepal during Feb 2-3, 2011 at Kathmandu University International Center (KUIC), Dhulikhel, Nepal. The Symposium was attended by 35 participants from different institutions. Prof. Bhadra Man Tuladhar, Registrar of KU, inaugurated the program by lighting a traditional lamp and switching on a plasma lamp. In his address, Prof. Tuladhar encouraged young generations to come forward to contribute actively in research. Prof. Panna Thapa, Dean of School of Science, KU delivered the welcome speech. In his address, Prof. Thapa stressed on the active role of young scientists in the development of a nation. Prof. Bhola Thapa, Dean of School of Engineering, KU also put his view on the importance of the symposium. Dr. Deepak Subedi, Coordinator of the Symposium and Head of the Department of Natural Sciences, KU presented the highlights of the program. The program was conducted by Dr. Raju Khanal, Coordinator of the Symposium representing the Central Department of Physics, TU. Four scientific papers were presented in the first day’s program. Second day of the symposium started with the poster session. The poster presenters were also allocated five minutes each to present their papers orally before they went to the display. Altogether eleven posters related to the research works in plasma physics and material sciences were presented. The oral session on of the second day started with a presentation on Hadronic Mechanics by Prof. Bhadra Man Tuladhar. Altogether four papers were presented. In the closing ceremony, Prof. Panna Thapa congratulated the participants for successful participation and appreciated their contribution. He also distributed certificates to the participants. 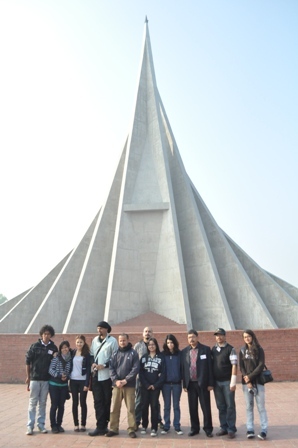 Kathmandu University participated in the Fifth South Asian Universities Youth Festival (SAUFEST) hosted by BRAC University, Dhaka, Bangladesh, from 25 to 30 December 2010. 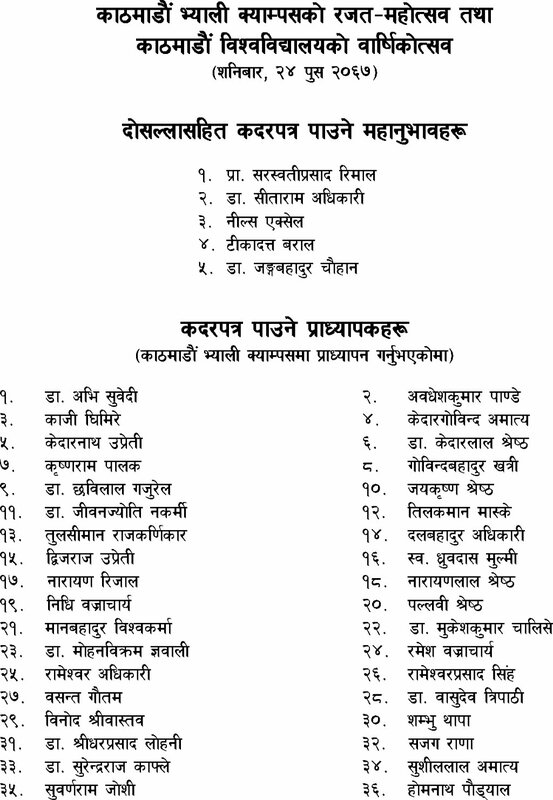 A contingent of 10 persons led by Prof. Dr. Jangab. B. Chauhan and Dr. Dhurva Gauchan took part in Folk dance, Light Vocal, Fine Arts, Poster Presentation, Cartoon and Debate. The Kathmandu University team was honored with the titles Best in light vocal (Lochan Rijal, Department of Music), Best in Public Speaking (Sumati Maharjan, Department of Languages and Mass Communication), Best in Painting (Man B. Harijan, Department of Art and Design) and Best in Poster Making (Shraddha Shrestha, Department of and Design). Dr.Kanhaiya Jha, anassociate professor of mathematics in Kathmandu University, has been felicitatedby Dayanand Anglo Vedic (DAV) SushilKedia Vishwa Bharati School, Jawalakhel, Lalitpur, Nepal for his remarkablecontributions in the field of mathematics in Nepal on January 07, 2011. Thechief guest of this program was Dr. Minendra Rijal, the honorable minister ofcultural, Government of Nepal. On this occasion, two senior mathematicians fromTU Prof. Dr. Shailendra Kumar Mishraand Prof. Dr. Hira Bahadur Maharjanwere also felicitated.